Holidays. So good. I can’t say enough about how special this trip has been. Bringing my two little girls (8 weeks & 22 months) to my birthplace, the Netherlands, has been so beautiful. They’ve been troopers. We all survived the flight over and are now settling into the new 7 hour time difference. I’m stopping in here at “work” to share something really special to me. It was very nostalgic. Almost surreal, this past Saturday afternoon, when I visited what was the beginning for me. Where everything all started. I had never been back to this place. Not since the summer of 1997. My brother, sister & I had been visiting the Netherlands during that summer, 15 years ago. While staying at Erik & Margaret’s house (an Aunt & Uncle, their house is in the background on the right side) we met their neighbours (driveway and house in the foreground). They had a daughter named Danique that we became friends with during our 6 weeks there that year. Before I share with you why I bring up her name to you, you need to know a little about my Aunt & Uncle. Erik & Margaret had always made their living singing and performing. They performed very, very successfully as a duo and were always in big demand. Immediately prior to our arrival there that summer of ’97, Erik had just purchased a large brand new Martin branded lighting system. Top of the line for the day — very expensive. Please pardon my saying so, but my eyes lit up with excitement when he suggested that we set it up, along with his sound system, in the triple car driveway pictured here, at Danique’s house, for her 12th birthday party! This was going to be exciting!!! Having grown up in Canada, my Dutch was never really great. So instead of partying with Danique and her friends, I played the music and ran Erik’s sound & lighting system that my brother and I had helped him set up in this very spot pictured here. From the front right corner of the driveway pictured here, I played the music that provided the atmosphere for her party. One musical memory stands out far and above the rest. Yep… they had just debuted a few months earlier… the Spice Girls were HUGE that night! I couldn’t sing like my Aunt & Uncle, but wow was it fun entertaining people with music! This was my first ever exposure to the performing art known as being a “disc jockey”. I’d always thought it would be neat to return to this place that hosted the start to what would one day become a full time career for me. Erik & Margaret moved to Portugal before I was able to visit this place again. 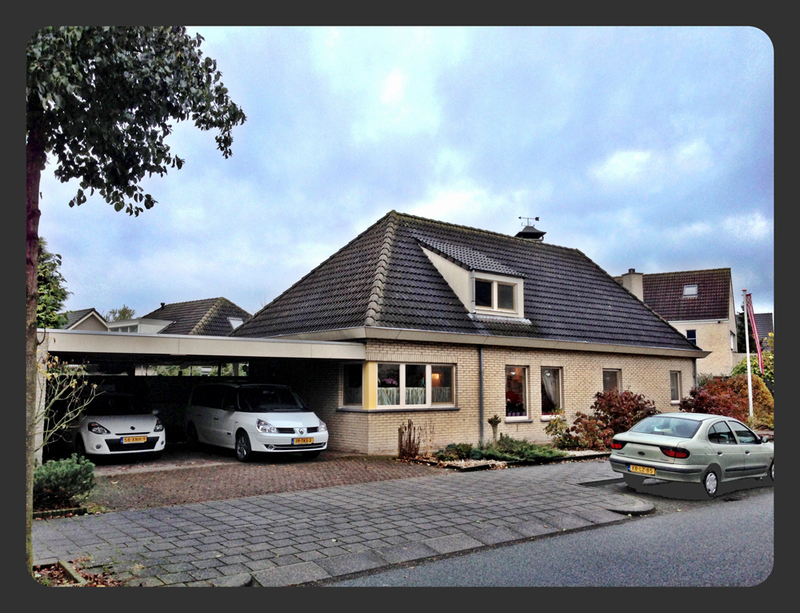 This past Saturday though, with some extra time while the girls were sleeping in the car, we drove to the address in Dongen where they once lived. Where Danique once lived. Where her 12th birthday party once happened. It was very surreal to think that it was on the bricks of this driveway where the inspiration first started that becoming a performing artist as a wedding disc jockey might be something that would be a full time endeavour. A full time passion. A full time love. Thank you to everyone who has been a part of this journey with me. From a part time hobby to what it has become today. To those who have helped me. Those who have given me the opportunity to help them. And most of all, to those who’ve brought me into their lives, to be a part of their special celebrations. This was the beginning and I am glad to now have this opportunity, 15 years later, to share it properly with all of you. Thank you. I just read through your whole website, and of course….. the story on this page sounds all too familiar! I encouraged you after some explanation to do the ‘sound & light’ during that memorable first-party-ever for you. It’s so good to see you found your PASSION, because that indicates that you really love this work and put in all your effort and energy over and over again. In the summer of 2013 I was lucky enough to see you being the “all-men’s-friend-and-part-of-the-family” while organising and preparing, D.J.-ing and light-ing, informing and improvising, leading and arranging, but always on-top-of-everything during one of your weddings! After my 30 years of experience on stage during numerous parties and events, I want to tell you from the bottom of my heart: “Dave, you are unique, high class and a true professional with heart for your clients / sorry ‘friends’. You take the extra step and over-deliver. I wish you all the best for the future, your Uncle Erik. Thank you so much for that WONDERFUL note Erik! As I mentioned in my “thank you” speech when I finally received my WED Guild designation (November 2013)… I am eternally grateful for what became of that fateful summer with you in the Netherlands when the seed would be planted for what would one day become an indescribable passion of mine. Thank you, thank you, thank you! Thanks so much for letting me see into your past and what happened that day truly changed your life. We really need to talk asap. Thanks Ed, much appreciate the compliments. We’ll talk soon. You are without a doubt one of the best in the business. We have told you before , however we can’t say it enough , The way you made our day so special is incredible ! Just Awesome! Happy Anniversary and up to another 20 ! Thank you so much Mies!